Drop in between 2 and 6 pm to with any questions you have about the job search process. Need advise on putting together resumes? Looking at future careers? Need help navigating the digital world of job searching? 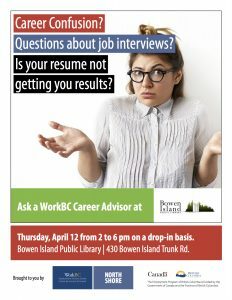 Chantal Rackley of WorkBC North Shore will be in the library Annex to help answer your questions. These one-on-one drop-in sessions are free!